We caught up with John Vanderpoel this evening in Gunnison, CO. One of our editors had read on CoBirds that he’d finally broken through the 700th year-bird barrier and we wanted an interview. Vanderpoel was happy to oblige. 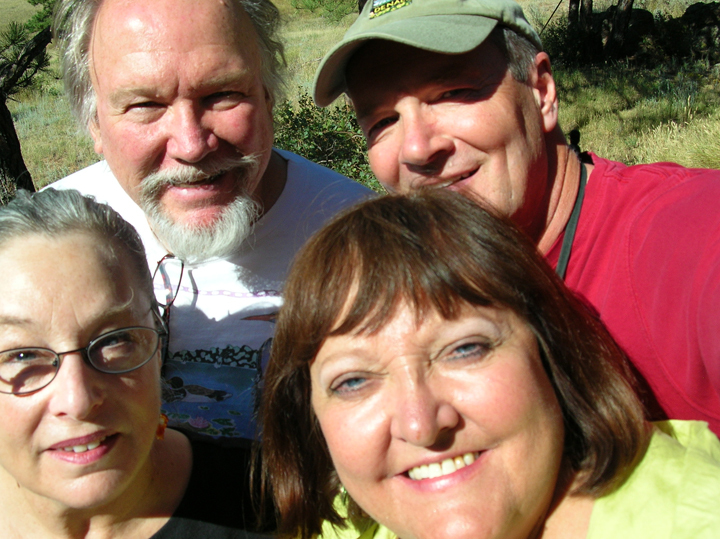 “Linda and I were headed out the door for Gunnison around 8:30 AM when the phone rang. Davis was on the other line. 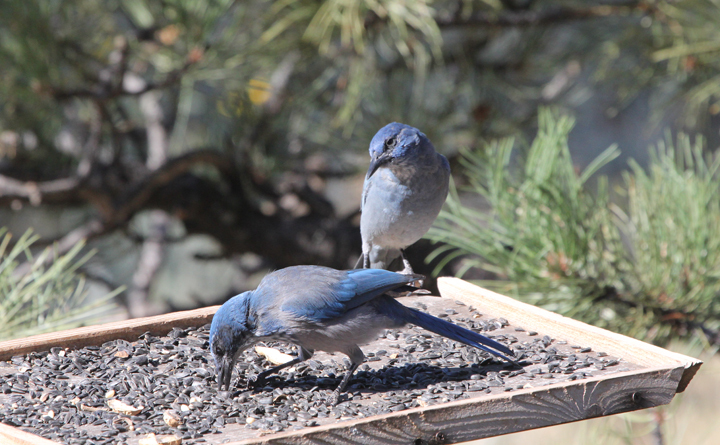 Seven Pinyon Jays were at his feeder eating peanuts and sunflowers. “ According to Linda, John was putting the pedal to the metal on the 25 minute drive up the canyon to the Davis residence. When they finally arrived they were greeted by Nina Davis, who was standing in front of the house with a big smile on her face and a thumbs up. She knew it was John’s 700th year-bird. 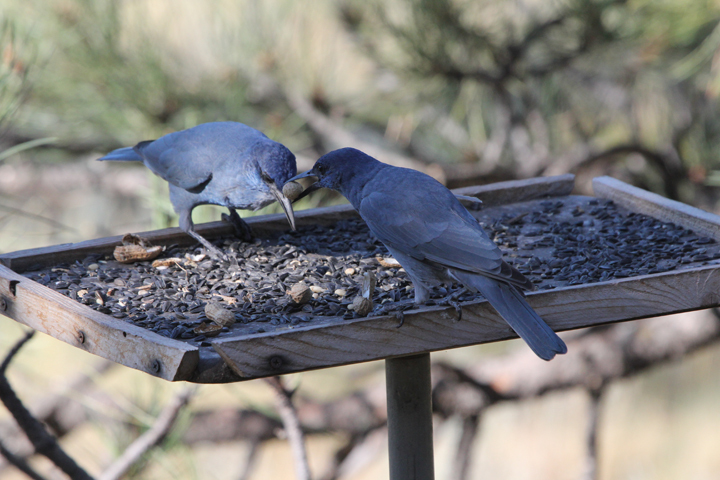 The jays were quite cooperative. At one point a Western Scrub-Jay joined the parade. We asked Vanderpoel what the significance of seeing his 700th bird at Davis’s and in general achieving 700. He told us “First of all, it was great to get the Pinyon Jays at Davis’s. We’ve been long time friends and his property has always been one of my favorite places to bird. As far as the magic number of 700, I’ll call my Uncle Bob tomorrow. he after all was the one who suggested that anything short of 700 in an ABA Big Year wasn’t going to cut the mustard. From what I learned from Chris “The Hitman” Hitt, 700 is a pretty exclusive club. I guess I’m the 15th person to reach this goal. I’m happy and humble, but plan to continue to push, push, push”. Vanderpoel was in a great mood. Who wouldn’t he be after not only hitting 700 but then getting #701 this afternoon. “Linda and I drove south out of Gunnison on CR 38. About four miles past the end of the pavement I decided to pull over and scan the draw on the east side of the road. It looked promising. Sagebrush covered the slope then ended at the grass line at the bottom of the draw. It seemed to be excellent feeding habitat for grouse. 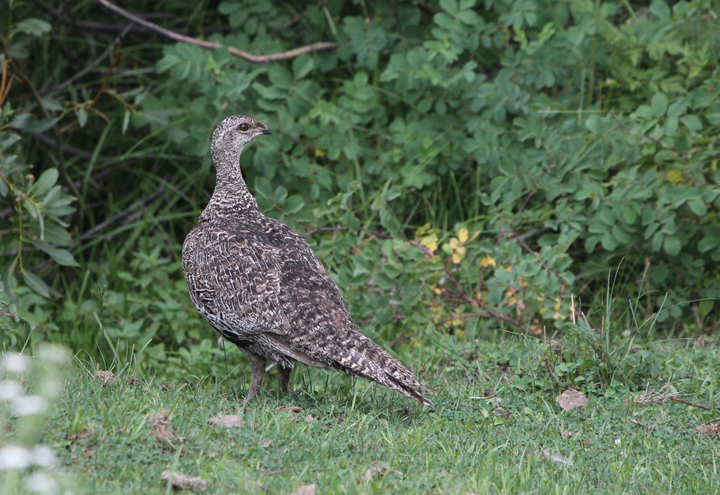 Immediately, I located four Gunnison Sage-Grouse feeding in the grass about 75 yards from the road. 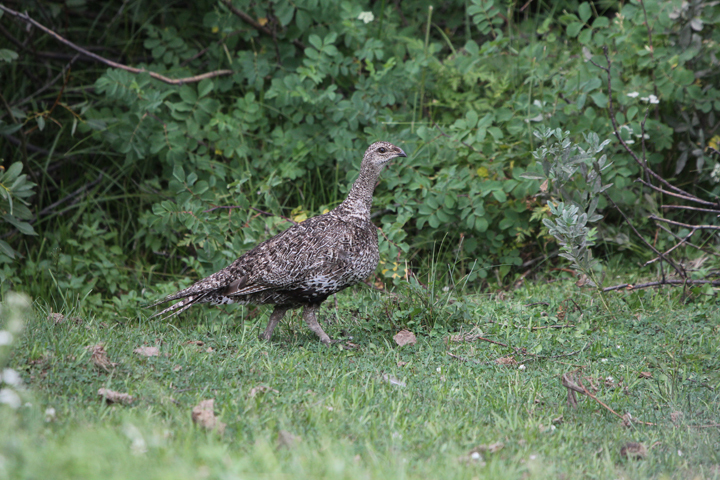 Unfortunately, Linda couldn’t pick up the birds in my binoculars and soon after they vanished into the sagebrush.” However, on their return drive back to Gunnison, eight sage grouse made it real easy for them by feeding 25 feet off the road in the open. Here are a couple of Vanderpoel’s photos. We decided to push John to predict just how many species he would end up with by year-end. He sidestepped this question like a seasoned politician on the campaign trail. However, when we mentioned that John Puschock of Zugunruhe Birding Tours (John and his brother bill will join him in Barrow in early October) predicted that John would tie Lynn Barber’s 2008 total of 723 species, Vanderpoel bristled that he’d beat Lynn’s totals if it was the last thing he did. Too much money for Citizens for Conservation was on the line to not accomplish this goal. We know of course that it doesn’t really matter what Vanderpoel says today. His trip to Alaska next week will determine whether he’s battling for 1st place, 2nd place or 3rd place. Vanderpoel abruptly ended this interview saying that he needed to get some sleep. Tomorrow morning would be a hard drive to North Park. Greater Sage-Grouse were waiting!